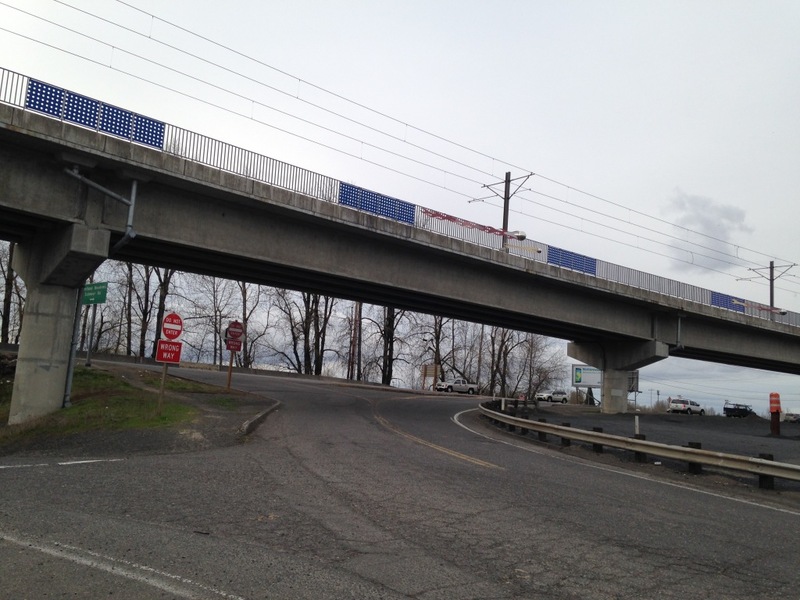 When I first moved to Portland, I was surprised to find that, for all the city’s bikeyness, there wasn’t much in the way of real infrastructure. There are plentiful bike shops, bike parking at most local businesses, bike wayfinding signs, bike-themed bars, bike maps, and many other elements of bike culture. 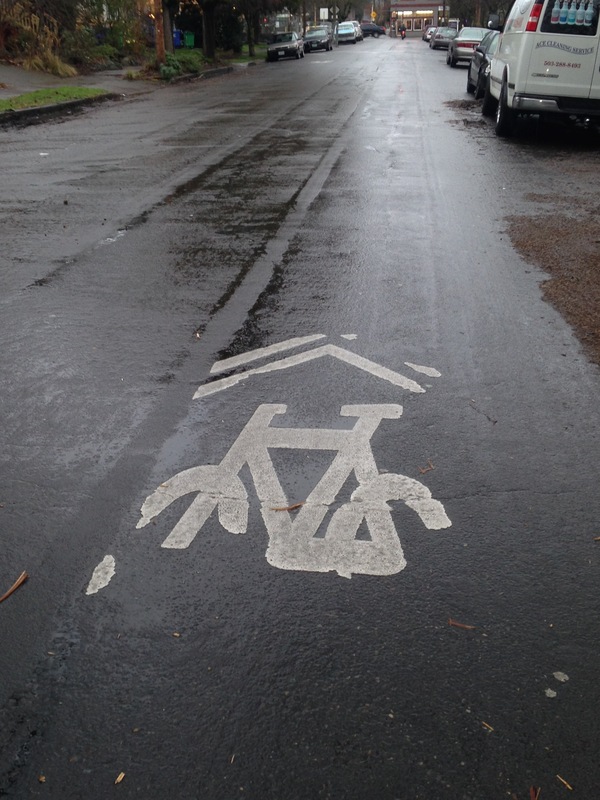 PDX infrastructure in a nutshell: the half-obliterated sharrow. The city encourages bicycling, but the most important element — infrastructure to support it — is the weakest link in the chain. I’ve been wanting to write this post for a long time, but I’ve also been wary. People who live in Portland and those who dream about it as the Bikey Promised Land are pretty attached to the idea that this is a bike-friendly place. And some of them get angry when I suggest that it’s not. Others have admitted to me (often with a bit of wariness themselves) that they were surprised, as I was, to find the road environment an uneasy mixture of bike friendliness and bike hate. In the last 18 months or so, the balance has shifted firmly into the unpleasant column, and more of us who live here and ride these roads every day have begun to talk openly about the problems we’re experiencing, not just intermittently, but incessantly. The combination of an exponentially increasing population migrating in from car-centric cities and suburbs (nearly 10,000 in 2014 alone), and a local transportation bureau that, while well-intentioned, is hamstrung by a difficult political climate and its own tendency to proceed at a glacial pace, is hurtling us into a very unpleasant and, if I’m any judge, damned dangerous future. 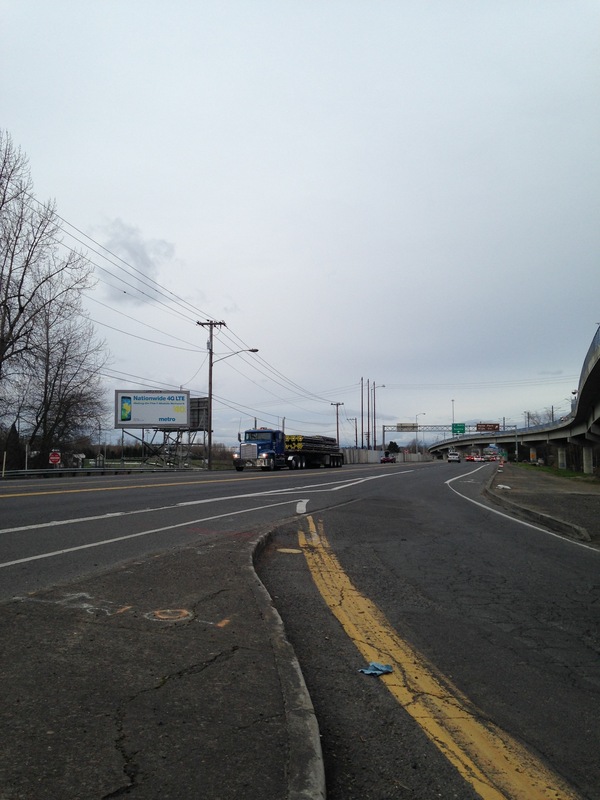 Portland’s existing infrastructure was predicated on low-traffic streets which are not low-traffic anymore, and on a cultural norm of politeness and willingness to conform to traffic laws, which is no longer the norm. Before we move on to specifics, let me preface this by saying that I know what it’s like to ride with no infrastructure whatsoever. I’m not a spoiled, ungrateful Portlander whining over imperfections in an awesome system. I began my daily riding career in the New York City of 2001. That city had no bike lanes, and almost no one was riding. I used to see the same half-dozen messengers going to and from work on the Queensboro Bridge. Those were the cowboy days, the Wild West. I rode through that city’s changes, through Janette Sadik-Khan’s heroic and often contentious battle to humanize the streets, through the bikelash, complete with lawsuits trying to remove a protected bike lane on Prospect Park West, the removal of another bike lane because of pressure from a religious special interest group, ticket blitzes for bogus offenses (e.g. NYPD squad car parks in bike lane, tickets cyclists for legally riding around it). I know what it’s like to be in a hostile environment. So when I tell you these streets are getting hostile, please believe that I know what that means, and where it leads. What’s wrong with Portland’s bike infrastructure, anyway? In many ways, what’s wrong with Portland’s bike infrastructure is a primer on what’s wrong with U.S. bike infrastructure (where any exists) in general. Perhaps the best way to get at this is by looking at a few key principles that govern infrastructure in a place where it does work — the Netherlands — and at which Portland is failing. Separate bicycle routes from motor vehicle routes to minimize conflicts between vehicles traveling at different speeds. 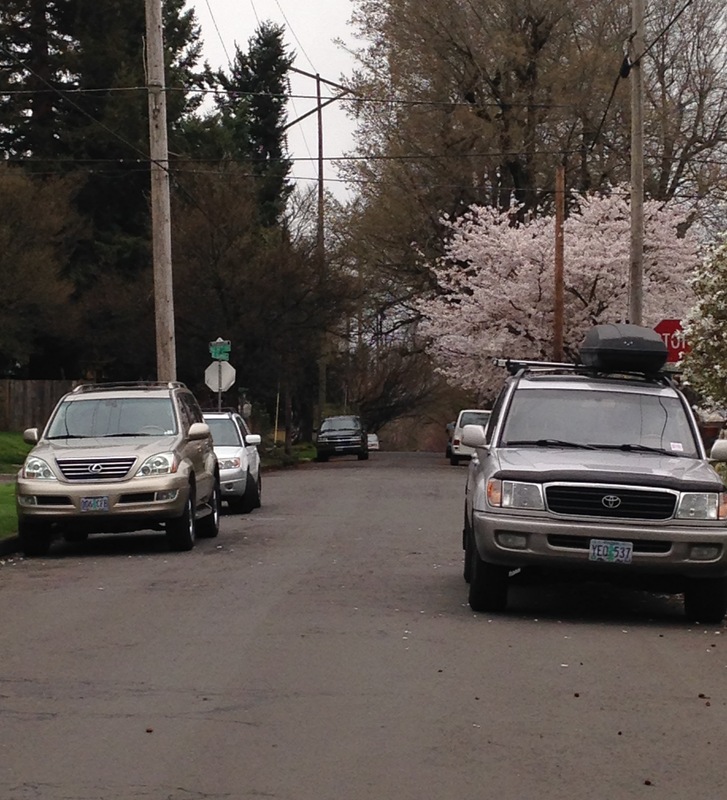 Virtually all bike routes in Portland are on roads shared with cars. The vast majority of bike infrastructure here consists of standard, unprotected, on-road bike lanes and sharrows. In other words, paint. The only paths that are (theoretically) closed to motor vehicles (I’ve encountered motorcyclists driving on them) are “multiuse” paths, which are shared with pedestrians (and dogs, and horses) — and are too narrow to be shared safely. Portland’s “bicycle boulevards” were developed as a stab in the direction of separating bicycle and motor vehicle routes. Unfortunately, not only are these streets still open to motor vehicles, but most have become favored routes of drivers wishing to shortcut around the traffic on arterials, or simply to avoid stop signs (bike boulevards have fewer stop signs than neighboring streets). In many cases, the frequency of aggressive driving on bike boulevards has made them less comfortable to ride on than streets without a bike route designation. Design intersections to eliminate conflicts between bicycle and motor vehicle traffic, and to protect bicyclists. 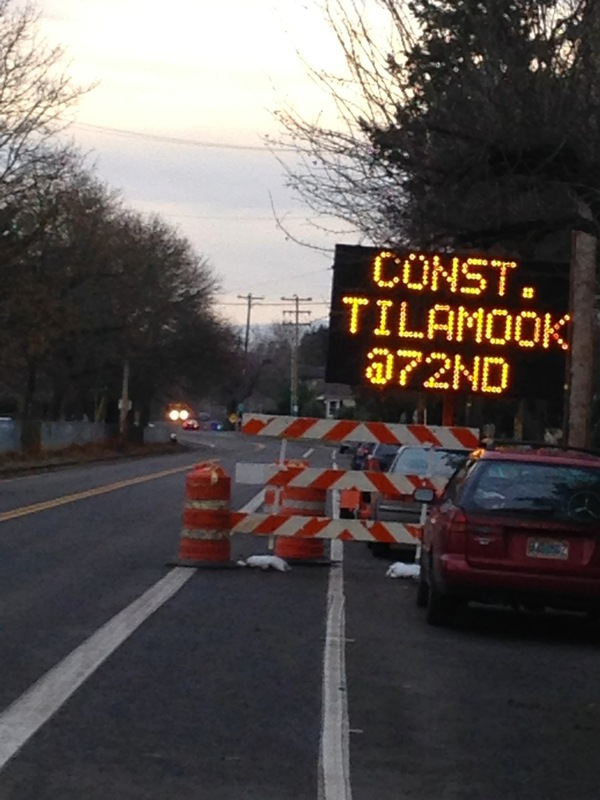 Portland is notorious for leaving bicyclists to their own devices at tricky intersections. There are many variations: the bike route that crosses an arterial with two lanes of traffic in each direction, with no traffic light and a center island that’s too narrow to comfortably accommodate a bicyclist for a two-stage crossing (16th and E. Burnside, 39th and SE Couch or SE Ankeny); the bike lane that disappears at the intersection, with an unhelpful “bikes merge into traffic” sign; the four-way (or even more) intersection with blind corners and no stop signs in any direction (most intersections in Alameda and Laurelhurst). One of the major issues in the recent redesign of the heavily traveled N. Williams bike lane has been the lack of safe treatments at intersections. 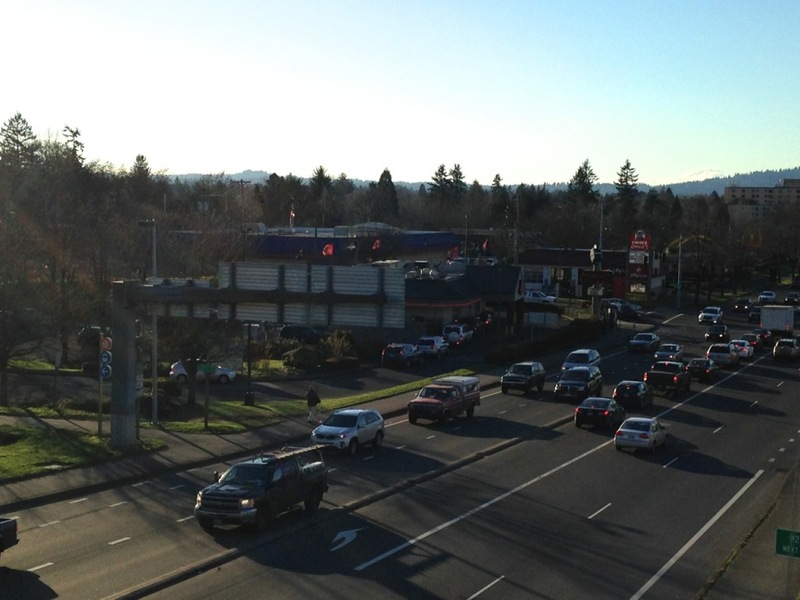 Standing outside the New Seasons Market at N. Williams and Fremont one Friday afternoon at rush hour, I was transfixed by a steady stream of near-misses as drivers crossed the left-side bike lane to turn left onto Fremont. That intersection desperately needs a separately signaled treatment like the one used for intersections on Ninth Ave. [pdf] in New York City. Of course, NYC has its own issues with infra disappearing where it’s most needed. 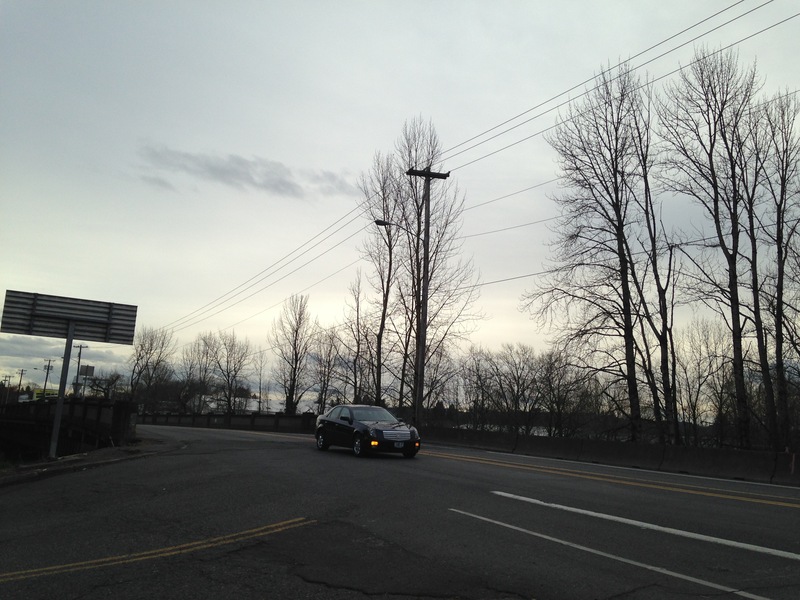 A classic example of “intersection oversight” is the short new multiuse path that was built to (theoretically) provide bike access from Vancouver Ave. to Portland International Raceway (site of many OBRA bike races) and the (shabby, torn-up) path adjacent to it that continues around the Columbia Slough to Smith and Bybee Lakes. It’s a great idea, and a sorely needed connection, but the city built a scant mile of nicely paved path that ends abruptly at an absolutely terrifying untreated crossing of Denver Ave. To complete the linkage to PIR and the Slough path, the bicyclist must cross a complicated, staggered intersection consisting of four lanes of highway traffic, on a blind curve, with no traffic signal or other safety provisions, and several on- and off-ramps and service roads coming together. The approach to PIR from the bike path. Traffic approaching at ~65mph from a blind corner to your left. A staggered intersection and more highway traffic to your right. Create a connected network of high-quality bicycle routes, so that bicycling is both safe and convenient for transportation. When I first moved here and began learning my way around town, I kept thinking that I was missing something. There must be a network of useful, safe bike routes that I just didn’t know about. You’d think they’d put that information on the bike map, but then, I’d never found NYC bike maps to be helpful (by the time the NYC DOT created an official bike map, I’d been riding there for years). Turns out, neither I nor the map were missing anything. There’s no network. The bicycle boulevards meander in roundabout wiggles, and when following any recommended bike route, there are difficult crossings of what I think of as barrier roads (wide, high-speed “stroads” with no traffic signals to help the bicyclist or pedestrian cross). The city is sliced north-south by one freeway and east-west by another, and bicyclists can only cross at a few places — none of which prioritize our safety by offering protected or separated lanes or a bike phase in the traffic signal. Essentially, if you have to get somewhere by bike, you’re going to be “sharing” the road with drivers, many of whom interpret that phrase as meaning they’re entitled to shove their vehicle right up next to you to “share” a single lane. 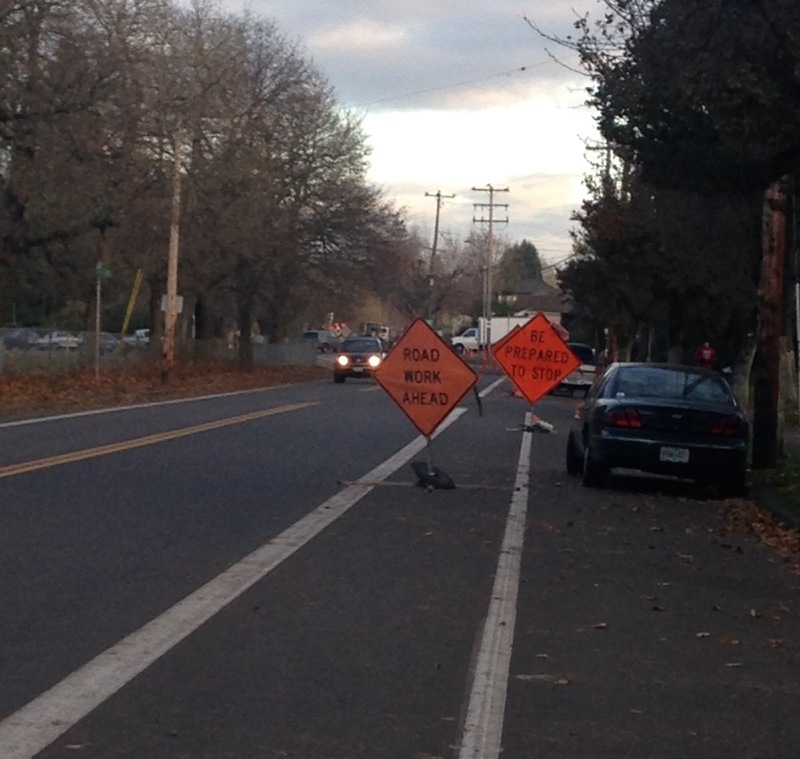 Welcome to “bike-friendly” Portland. Visibility is frequently hampered, meaning that a driver or bicyclist has to pull far out into the intersection — into the path of traffic — before he or she can see said traffic. Double-sided parking artificially narrows the streets, creating unsafe conditions for bicyclists when impatient drivers insist on “sharing” that narrow lane, or buzzing past within inches, often into oncoming traffic (or another bicyclist). Anyone who’s ridden on a bicycle boulevard/neighborhood greenway knows that the posted speed limit of 20mph is followed by exactly nobody — except perhaps the bicyclists. One of the most dangerous elements of our driving culture (and by “our,” I mean the entire US) is the universally accepted view that a posted speed limit is to be treated as a minimum, not a maximum. Not only is it considered acceptable to exceed the speed limit, there’s a stigma attached to driving at or under it. “You’re driving like an old lady! Speed up! Pass that bicyclist now!” And this attitude persists regardless of road conditions, which in a frequently rainy part of the world, translates to dangerous driving before you even add in distraction/inattention, drunkenness, and aggressive behavior. Just yesterday, I was forced up against a line of parked cars by a pickup truck driver going 45-50mph on the Clinton St. neighborhood greenway (speed limit: 20mph), aiming right at me and revving his engine. There’s precious little enforcement of speed limits in residential areas, and when sting operations are conducted, they mostly pull over bicyclists — because they’re easier to catch. The only truly effective method of speed limit enforcement is traffic cameras, which of course we don’t have. There’s also no good way for a bicyclist to report harassment and dangerous driving — you can call in a license plate number, but unless (and probably even if) you got video showing the driver’s face, the police won’t take action. Not to mention the fact there seem to be zero consequences for drivers who completely disregard what bicycle and pedestrian infrastructure there is. The night I rode 30 miles in a 60mph windstorm to attend a meeting with about 20 other bicyclists from all walks of life to ask PBOT to make changes address the safety issues on the Clinton St. bicycle boulevard, I was encouraged by the apparently receptive attitudes of the PBOT staffers. Since that time, I’ve been discouraged to see that while individual staffers’ concern or sympathy may be genuine, the decision-makers at the organization are utterly unwilling to act, even when citizens give them exactly the support they say they need to make changes. And then there are the — to my mind bizarre — decisions like this, and this. Got a problem with right-hooking in the bike lane? Just take out the bike lane! That’ll solve everything….Huh? 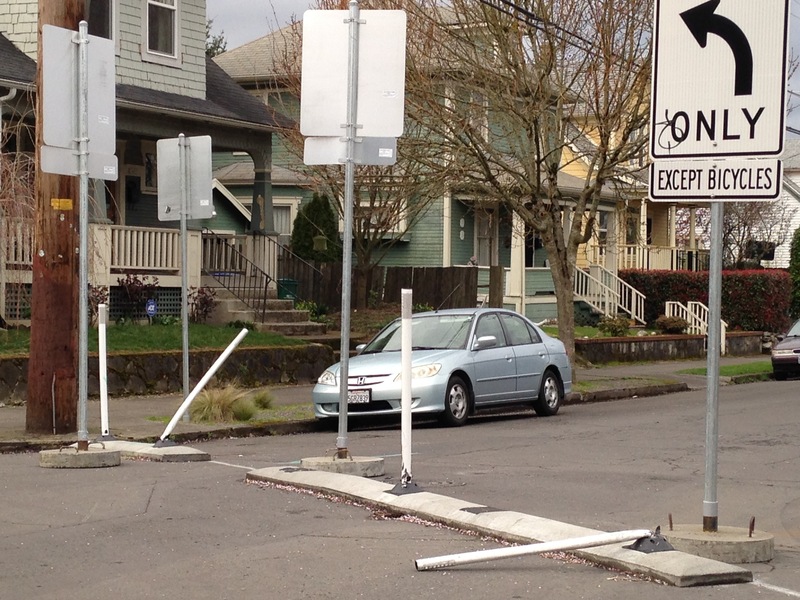 It means understanding that making a trafficky, limited-visibility crossing (such as SE Salmon and 30th Ave.) safe for bicyclists and pedestrians requires more than simply putting a sign up warning drivers that there may be bicyclists and pedestrians trying to cross there. It means building physically separated and/or protected bicycle paths, even though they’re a bigger investment of financial and political capital than painted lines. We have to build infrastructure for the species we are, not the species we hope to be. That means planning our streets, cities, and towns in a way that ensures that the inevitable human error (or aggression) does not have fatal consequences. The debate between those who want protected infra and those who argue that no infra is needed and that people on bikes need to simply assert their status as vehicles “just like cars,” and “everything will work out fine” has been going on for years, and it’s not going to get solved today. But wherever you stand on the subject, it’s hard to argue convincingly that vehicular cycling will work for children, or to debate the fact that places with high-quality infrastructure have high rates of bicycling — and those with poor or no infrastructure have low rates. The truth is that people will do what they feel comfortable doing, not what is theoretically possible, or what someone tells them they should be doing. The country with the highest bicycle mode share in the world — the Netherlands — is, not coincidentally, also the place with the most complete network of high-quality infrastructure designed to make cycling both safe and convenient. For everyone. As someone who’s ridden in extreme traffic situations, I’m often asked why I care so much about infrastructure. Why should it bother me? Aren’t I “strong and fearless”? Setting aside (for a moment) the fact that it’s important to me that where I live be a place where anyone, and everyone, can ride safely, comfortably, and conveniently, there is a vast difference between what I can do and what I want to have to do on a daily basis. Our culture has an unfortunate tendency to conflate bravery with fearlessness. Yes, I’ve ridden up Lexington Ave. at rush hour, mixing it up with the taxis in the left lane (because that’s actually the better position than the right, with buses stopping to discharge and pick up passengers). Yes, for years I braved a 30-mile commute in the most intense, nonstop bullet-dodging traffic imaginable. I was terrified the whole time. I still am. Every time I get on my bike, I have to shoulder the anxiety that sits heavier than any backpack. Most days, the love of the bike itself — the pure beauty of pedaling, of moving myself through the air — is strong enough to convince me to keep riding. But not every day. And it’s getting harder as I get older, both because the accumulated weight of years of stress, hostility, and near-misses is wearing on me, and because I’m physically less resilient than I used to be. My muscles may be stronger than ever, but I don’t heal as quickly from injuries, and there’s no getting around the fact that the bones of a 50-year-old are brittler than those of a 30-year-old. So I care more about having real (read: protected, separated) infrastructure as I get older. I want the place I live and ride to be safe for me and for the five-year-old who’s waving madly at me, spilling over with that special, luminous pride that comes of getting the knack of balancing on two wheels for the first time. Believe it or not, our needs are exactly the same. And we both deserve it.